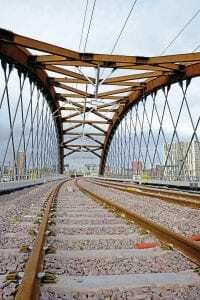 MANCHESTER’S three main railway stations are now connected for the first time by the £85million Ordsall Chord – the centrepiece of Network Rail’s £1billion Great North Rail Project. The chord has caused much controversy, having been constructed across the 1830-built rail access to Manchester’s Museum of Science and Industry (MOSI), but the 300m double-track electrified connection was ceremonially completed on November 9 – ahead of schedule and on budget. It will open to passengers when the new 2017/18 timetable comes into force on December 10. Centrepiece of the chord is the world’s first asymmetric network arch rail bridge, designed by local architects BDP, in collaboration with Parsons Brinkerhoff, Aecom, and Mott MacDonald. The complex 89m-long structure, weighing 1,600 tonnes, crosses a main road and the River Irwell, which separates the cities of Manchester and Salford at this point. The connection is designed to improve rail services across the north of England, allowing trains to run directly from Manchester Airport, Piccadilly and Oxford Road stations to Manchester Victoria and on via the Standedge and Calder Valley routes to Yorkshire and the North East. The Great North Rail Project promises to deliver faster and more comfortable journeys across the north of England by 2020, with new trains, extra carriages, and more than 2,000 additional services each week.